The LLM115 is a laser diode module with a built-in (internal) line-generating optic. It emits a defined laser line that can be used to align objects by eye or camera in industrial environments. Wavelengths of 520nm (green) and 635nm (red) are available with powers up to 5mW. The 1mW red LLM115 is a Class 2 laser, widely accepted as safe under all conditions. Additionally, the green LLM115 emits light that appears more than 2X brighter to the human eye than the equivalent power in 635nm. As a result, you’re more likely to see these projections against dark materials, in high ambient light levels, or from long distances. 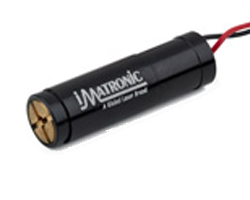 The LLM115 can be installed with a TTL modulation input allowing you to drive your laser using a digital voltage signal. You can then change the mark-to-space ratio to control the mean intensity of the output beam, modulate the laser with coded information, or synchronise the laser with an external measurement device such as a photodetector or camera. Please contact us directly for a custom solution i.e. a wavelength, power, or fan angle not mentioned in the product documentation.